Four years in the same campus dorm looks bleak. Are there any ways to improve my room without spending a fortune? Your question is relevant for all students, especially if they'll be living in a dorm for the whole 4 years. Tuition and living expenses at college are going up every year. It encroaches on the budget for other things, like your home and entertainment. Since you're busy studying, we have researched ideas for you on how to creatively and economically spruce up your place. You will now be joining the nearly 50% of U.S. college students living away from home. The major room outlays will be for appliances such as fridge, TV, microwave, and coffer maker. Students and parents all prefer to shop online at home, before moving to college. These are essential items, along with your bed and other furniture, which leaves little left over for comfort and décor. Before you start any major redecorating, it's wise to check with the college to see what is permissible. Many have a long list of restrictions on modifications to campus accommodation, especially if it involves paint, nails or screws. If you are allowed to paint, choose a neutral color scheme with an accent shade to enhance it. Do not go overboard with gaudy wall colors, which you will quickly regret. You create a warm environment and then add decorative pieces to complement or contrast with your base colors. 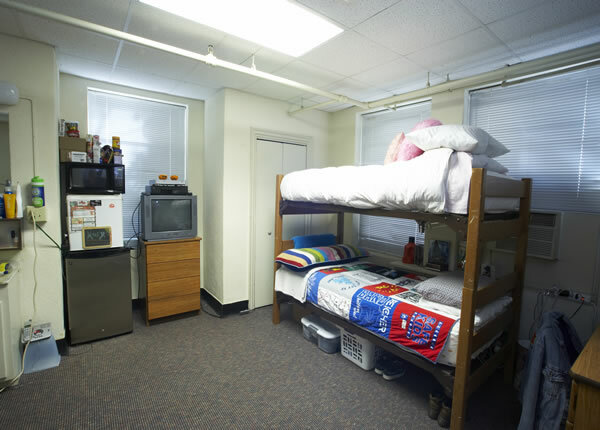 Your college room space is typically small with the bed as the centerpiece. A folding or sofa bed can give you some extra floor space when entertaining. Whatever bed you choose, make sure you have comfortable pillows and a quality mattress. Don't take sleep for granted in the coming years. There is no information on the average lifespan of a college mattress, so consider adding a mattress topper for support. To increase your usable square footage, try to find tables with hidden storage space. Some manufacturers offer furniture pieces that serve a dual function. Your walls are your display canvas, so bring them to life with self-expression: photos, tapestries, art posters, flags, or simply some LED lighting to brighten the place up. Go green with plants. They will help make the room feel less claustrophobic and a little more healthful. You can recycle old jars and food containers for planters and paint them up for a quirky touch.